Have you ever heard of ice-cream 'misal'? 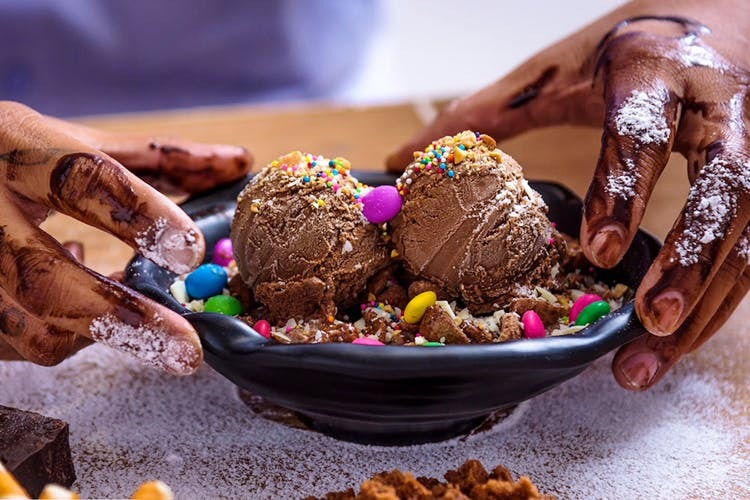 Well, Dezárt on Bhandarkar Road is an ice cream parlour with a twist - serving frozen treats like ice cream 'misal', that will tantalise your tongue. Dezárt serves a selection of teas, unique flavoured ice creams, 'plated at the table' desserts, sorbets, ice cream sandwiches, waffles, jaffles (MasterChef Australia fans know what we're talking about) and milkshakes. We spotted some really cool ice-cream combinations - like black pepper and honey with tangy kairi, Jaipuriya paan with thandai, lemon and curry leaf, and a Modak and Gulkhand ice cream, that have us intrigued.The main draw here is their special 'ice cream misal'. The name caught us off guard, but upon further investigation - we were relieved to find that it's not actually misal flavoured ice-cream, they're just ice cream dishes served with crunchy and saucy toppings - quite like how a misal dish has contrasting textures! Puran poli fans, you must try their puran poli ice cream misal - it comes with chunks of puran poli on kesar-pista ice cream, topped with fresh fruit, crunchy candy and chikki toppings. Sounds delish? We think their choco-oreo misal is just as tempting and more than enough to keep any chocoholic happy! They also serve a classic ice cream misal (where you can pick your own flavours and toppings), and a (seasonal) mango ice-cream misal. We think you should also try the apple-cinnamon jaffle (a jaffle is basically a stuffed sandwich made in a special sandwich grill), 'Dezárt at the table' Tiramisu, and their chilli-cheese toast (if you want a break from all the sugar). Dezárt also hosts their own art events, so keep an eye on their Facebook page for all the latest updates!